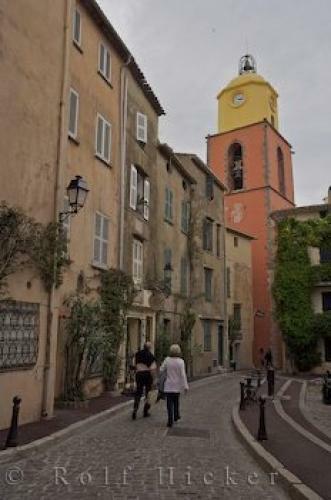 The colourful bell tower of the Eglise Notre Dame can be seen at the end of the the Rue Saint Jean, which is a narrow winding street in the Old Town of St Tropez in The Var, a department in the beautiful Provence, France. The Eglise Notre Dame dates from the 11th century, and is a noticeable landmark in the Old Town of St Tropez in the Provence. However, a church dedicated to the Virgin can be traced back to as early at the fourth century on that spot. The church today sits on a narrow winding street called the Rue Saint Jean, and is a favourite spot for tourists to visit. The l'Assomption Bell Tower dates from the 18th century as it was built much later than the rest of the church. Rue Saint Jean, St Tropez, Provence, France. ... However, due to its long history and dedication to religion from such a long time ago, it is a visit most tourists like to make. The church is located in the Old Town of St Tropez, which is now dedicated to preserving the history of the area, and some streets are shut down to cars and traffic and are just pedestrian zones, where people can browse shops, look at historical buildings, and eat in local restaurants and cafes. As you can see from the photograph the Old Town is a quaint place to visit and walk around, and when you come across sites like l'Eglise Notre Dame it makes it all worth it. Eglise Notre Dame l'Assomption Bell Tower in Rue Saint Jean, Street in Old Town St Tropez, The Var, Provence, France, Europe. I photographed this photo with the digital SLR camera model Canon EOS-1Ds Mark II, aperture of f/6.3, exposure time of 1/100 sec. on ISO 100, as always I used a original Canon Lens, the focus lenght for this picture was 30mm.